Context: Obesity from childhood to adulthood is associated with adverse health later in life. Increased youth BMI is a risk factor for later obesity, but it is unknown whether identification of other risk factors, including recently discovered genetic markers, would help to identify children at risk of developing adult obesity. Objectives: Our objective was to examine the childhood environmental and genetic predictors of adult obesity. Design, Setting, and Participants:Wefollowed 2119 individuals of the Cardiovascular Risk inYoung Finns Study for up to 27 yr since baseline (1980, age 3–18 yr). Main Outcome Measure: We evaluated adult obesity [body mass index (BMI) 30 kg/m2]. Results: The independent predictors (P  0.05) of adult obesity included childhood BMI, C-reactive protein (CRP), family income (inverse), mother’s BMI, and polymorphisms near genes TFAP2B, LRRN6C, andFLJ35579.AriskassessmentbasedonchildhoodBMI,mother’sBMI,andfamilyincomewassuperior in predicting obesity compared with the approach using data only on BMI (C-statistics 0.751 vs. 0.772, P0.0015). InclusionofdataonchildhoodCRPandnovelgeneticvariants forBMIdidnotincrementally improve C-value (0.779, P0.16).Anonlaboratory risk score (childhood BMI, mother’s BMI, and family income) predicted adult obesity in all age groups between 3–18 yr (P always 0.001). 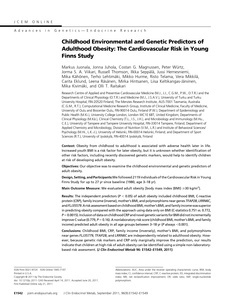 Conclusions: Childhood BMI, CRP, family income (inversely), mother’s BMI, and polymorphisms near genes FLJ35779, TFAP2B, and LRRN6C are independently related to adulthood obesity. However, because genetic risk markers and CRP only marginally improve the prediction, our results indicate that children at high risk of adult obesity can be identified using a simple non-laboratorybased risk assessment.